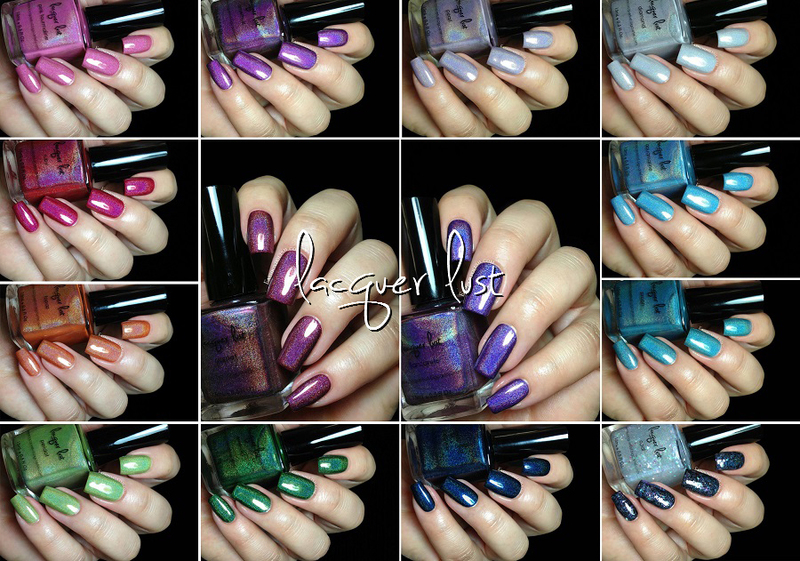 Fashion Polish: Lacquer Lust Birthstone Collection Swatches & Review! 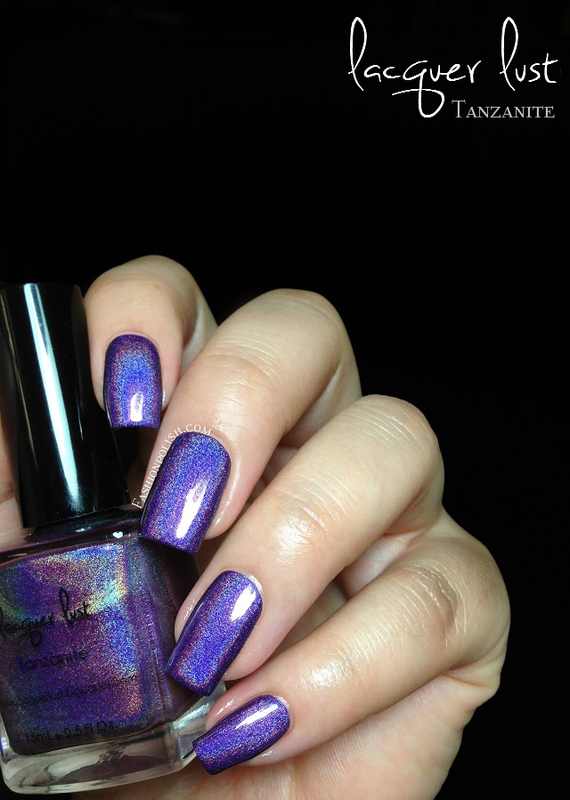 Lacquer Lust Birthstone Collection Swatches & Review! I must warn you this post is going to be pic heavy (and drool worthy...) so brace yourselves! 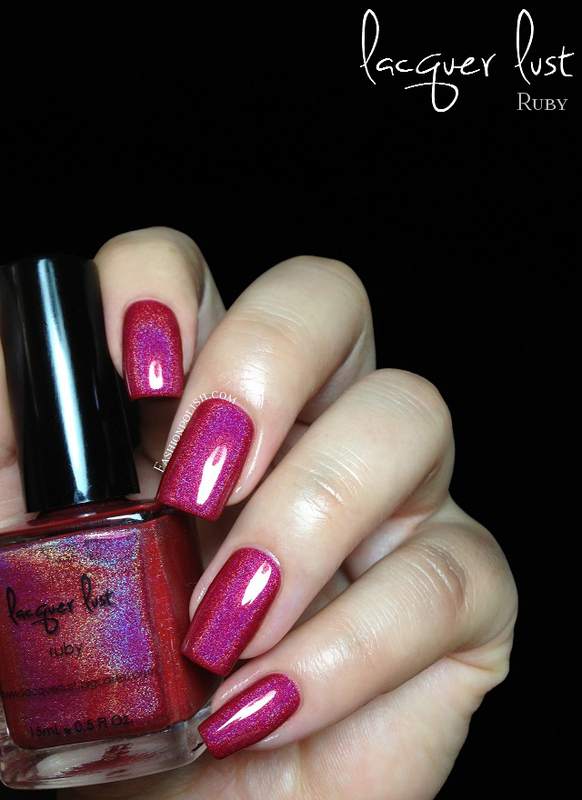 Garnet is a deep burgundy with a strong holo combined with small pink sparkles that lighten up the base color in the shade. It's such a Fall appropriate color! I don't think I have anything like it and believe me I've been hoarding holos like a crazy person LOL. Formula was jelliesque, easy to work with and required 2 coats for complete coverage. 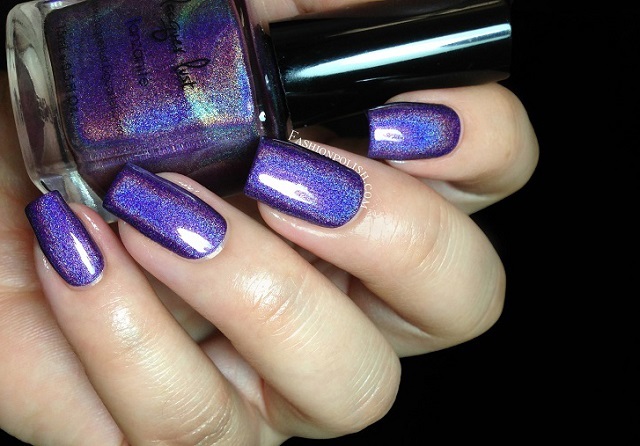 Amethyst is a warm toned dark purple with strong holo. You're probably going to hear this a lot today : ah.ma.zing! Great formula and coverage here as well, I barely needed the second coat to reach full opacity. 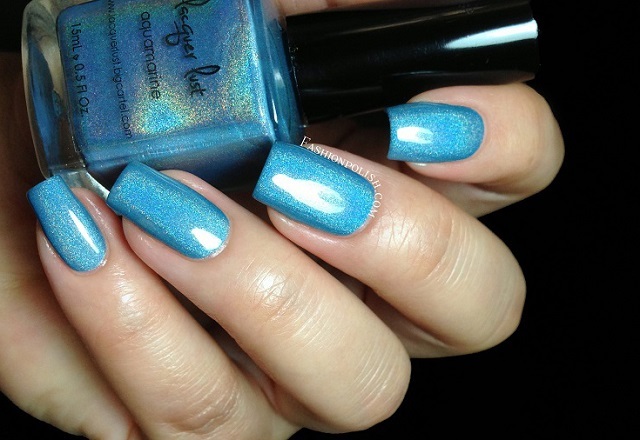 Aquamarine is an aqua blue with a subtle linear holo. Formula was more creme than jelly here and I really loved wearing it, beautiful! This is 2 coats plus topcoat. Diamond is a pale grey creme with a subtle linear holo as well as tons of really small silver, pink and green shimmer flecks. Delicate and so different from all of the grey/silver holos I have ever tried. This one might very well be one-coater on short nails! I used 2 thin coats below. 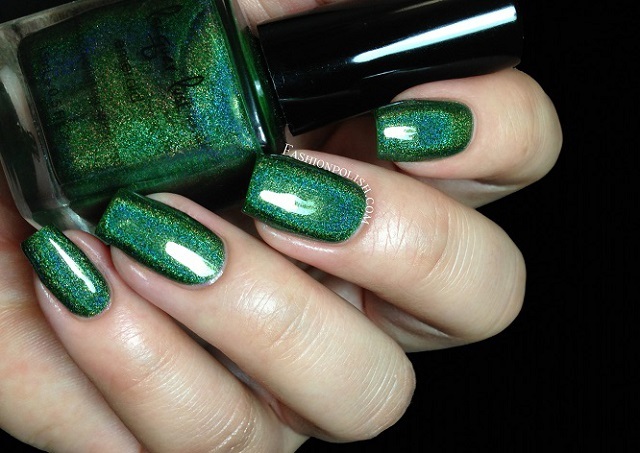 Emerald is a dark green with a really strong linear holo. If you follow me on Instagram then you've probably seen the swatch video I shared. I was so blown away by this polish that I spent more time admiring it than I should have: I removed it right after posting the video and totally forgot to snap picture LOL and had to re-swatch it today (hence the shorter nails compared to the rest of the review, sorry!). Jelly-like, easy to apply, formula and 2 coats in the pics below. 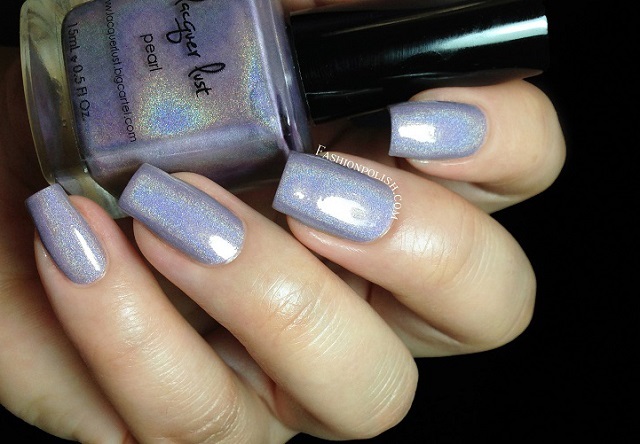 Pearl is a pale grey mauve with a subtle linear holo. I have a thing for dusty purples so this one's right up my alley, so soft and yet so modern! Consistency also creamy here and opacity excellent, almost a one-coater, I used 2 thin coats here. 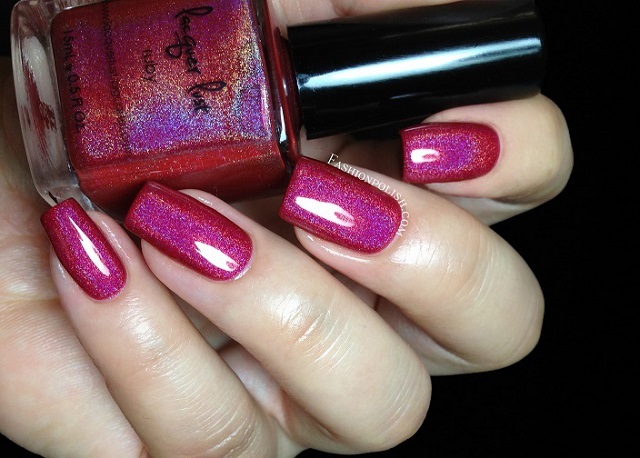 Ruby is a pink red with a strong linear holo. I think it might very well be the strongest non-metallic holo I have ever tried! Love, love, love it!!! 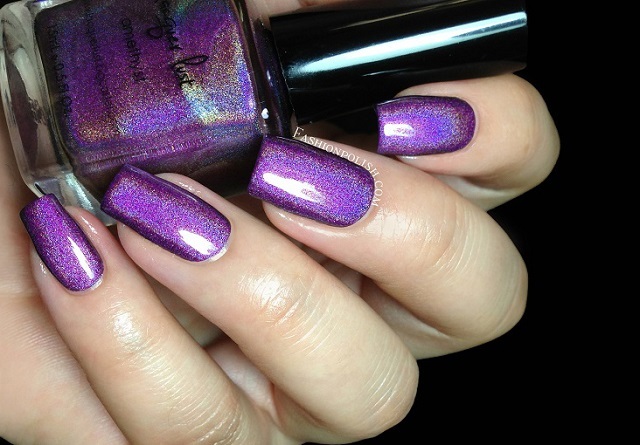 Wonderful formula and 2 thin coats for complete coverage here. 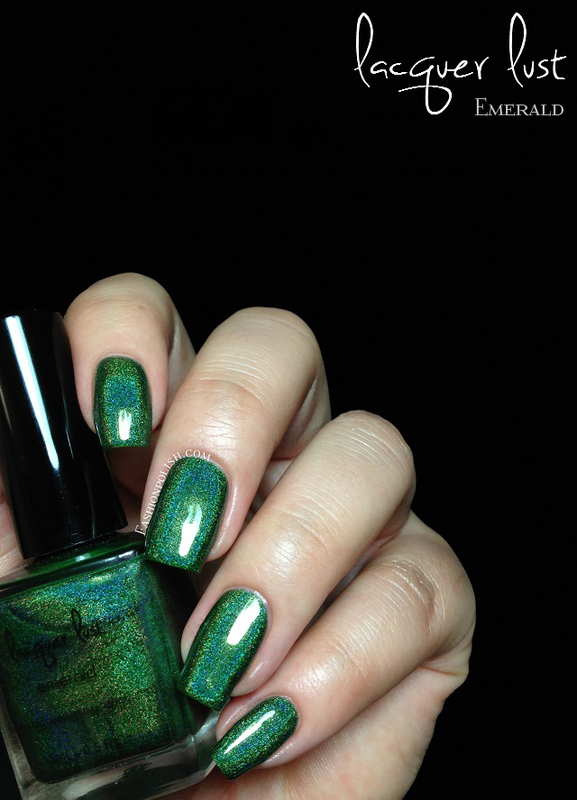 Peridot is a medium chartreuse green with a medium linear holo. Another unique polish, probably not for everyone but I don't mind "fugly" colors haha, quite the contrary. Jelly-like with a trouble-free application, you're looking at 2 coats plus topcoat. 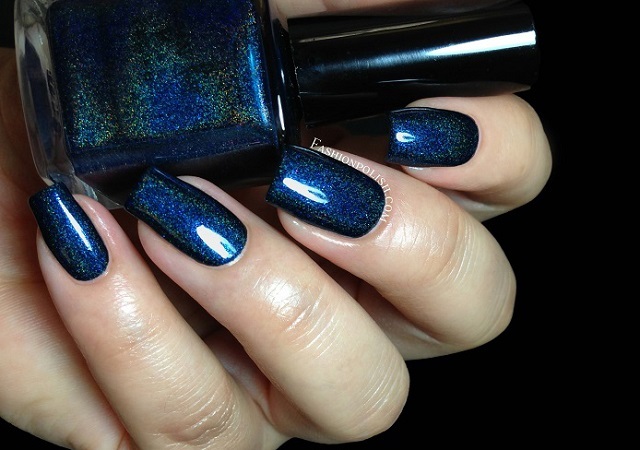 Sapphire is a blackened blue, leaning blurple with a medium linear holo combined with a blue shimmer and some pink/purple sparkles. How does that sound to you? Quite appealing if you ask me! 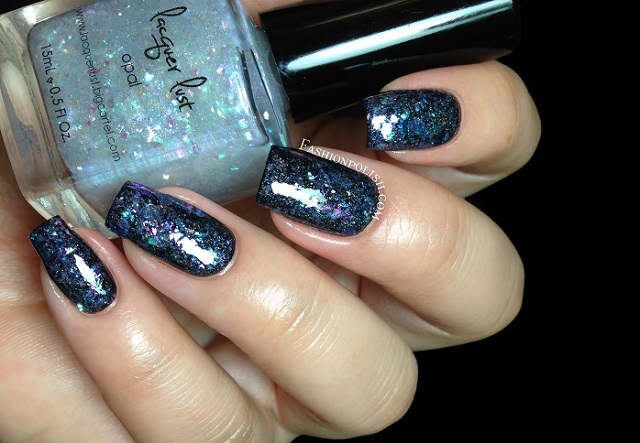 I also love this one, I guess I can't resist a dark holo lol. I used 2 coats plus topcoat. Opal is a super unique topper : holo particles combined with a crazy amount of multicolored pastel iridescent flakes! Another polish you won't be able to find dupes for! Formula was definitely on the thick side, being so packed with flakes, but I simply dabbed one "brush-load" over a black creme in my swatches here. 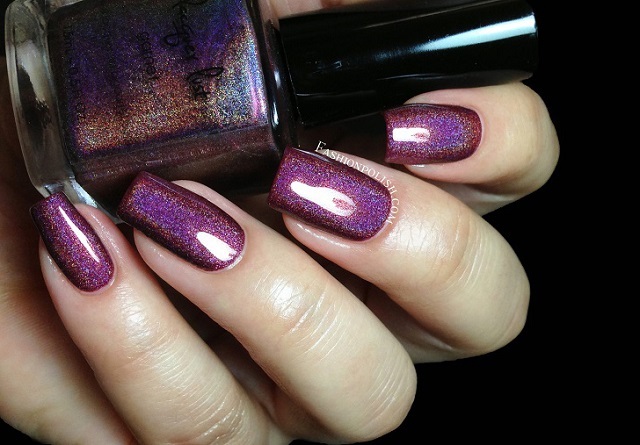 Pink Tourmaline is a medium purple based pink with a subtle linear holo, such a beautiful shade of pink! Super pigmented and with a creme formula, I barely felt the need for a second coat! This is 2 thin coats plus topcoat. Topaz is a burnt orange with a strong linear holo. Another "Autumny" color, warm, deep and super original, I love it! If you're not an orange person, maybe you should try burnt oranges like this one. Formula was thin and jelliesque but still a two coater. Zircon is a turquoise blue with a medium linear holo and a whole lot of blue sparkles. Slightly darker and greener than Aquamarine, I honestly couldn't tell which color I prefer! This one was the most sheer in the collection, I still used 2 coats and reached full opacity but depending on you nails length/application, a third coat might be necessary. Tanzanite is a dark purple with a strong linear holo. Very similar to Amethyst in terms of color tone, it's definitely cooler but also contains beautiful pink/purple sparkles. Another one I just love! Two coats were used in the swatches below. I did warn you in my previous Lacquer Lust review,right? This probably is the best holo collection in a looong time! They all have a little something that sets them apart from all the other holos I have and obviously they're just amazingly gorgeous! 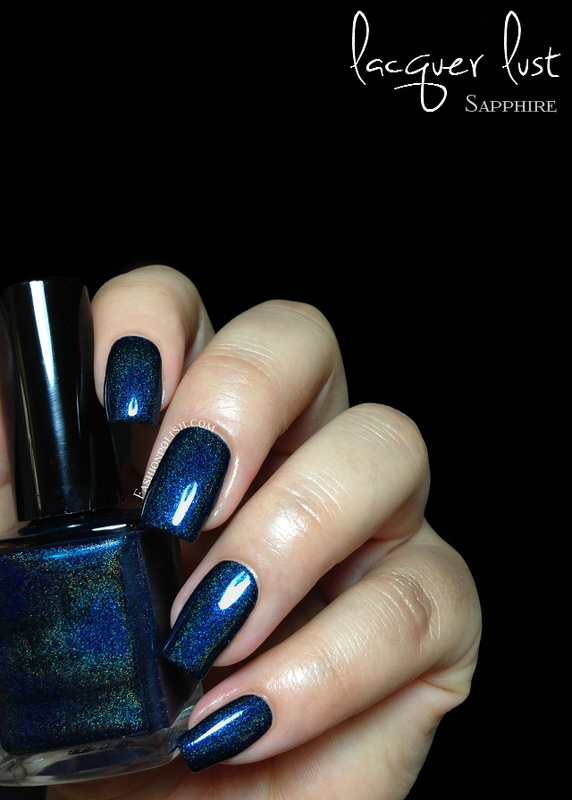 If you haven't tried any Lacquer Lust yet, now's the time, you'll be impressed. Mark my words! So what do YOU think about these? Anything caught your eye? The Lacquer Lust Birthstone Collection will be available for pre-sale on lacquerlust.bigcartel.com today August 31st at 9:30 am PST and will retail for $166 (full set plus free Lacquer Lust exclusive tote bag). Orders will ship out on September 14th. Individual shades will also be available starting September 16th on the Laquer Lust store and by the end of September on Harlow & Co.
For information, please refer to Lacquer Lust on Facebook.